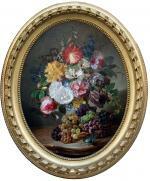 High quality still life painting from the Biedermeier Epoch was executed ca. 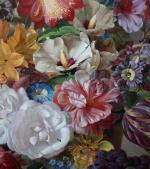 1840s by one of the best representatives of Viennese Flower School of 19th century Ferdinand Kuss (Kuess). 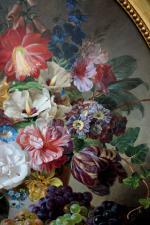 The artist was born 1800 in Vienna , died 1886 in Pörtschach/Carinthia. 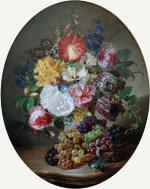 The artist, which works situated in the best collection including Museum of Prince Liechtenstein in Vienna, studied at the Viennese Fine Arts Academy by Sebastian Wegmayr, worked in Vienna, where was a member of the artist union "Kuenstlerhaus" and exhibited there his carefully painted flower and fruit still lifes. 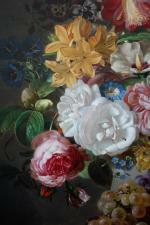 Technique: painted in oval, oil on canvas. 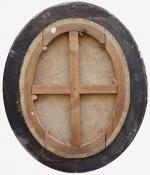 Original period gold-plated frame. Condition: in very good condition, original canvas.